The Global Volcanism Program has no activity reports for Snowy Mountain. The Global Volcanism Program has no Weekly Reports available for Snowy Mountain. The Global Volcanism Program has no Bulletin Reports available for Snowy Mountain. Glacier-covered, 2161-m-high Snowy Mountain, located 15 km NE of Mount Katmai, is the SW-most of a chain of closely spaced volcanoes extending NE along the crest of the Alaska Range. More than 90% of the compound Snowy volcano is mantled by glacial ice, which prompted the naming of the volcano by members of the 1917 Katmai expedition. Two small andesitic-dacitic stratovolcanoes, SW Snowy and NE Snowy, originated about 200,000 years ago. Only NE Snowy has been active during the Holocene. Late-Holocene collapse of this volcano produced a large debris avalanche that traveled to the north and left a large breached crater inside which a blocky lava dome was constructed. Peat beneath an ash layer thought to be associated with the the lava dome was radiocarbon dated at about 250 +/- 70 years ago. No historical eruptive activity has been documented, but fumarolic activity has been observed at NE Snowy. A zone of persistent diffuse shallow seismicity is located on and NW of the volcano. Hildreth W E, Fierstein J, Lanphere M A, Siems D F, 2001. Snowy Mountain: a pair of small andesite-dacite stratovolcanoes in Katmai National Park. In: Gough L P, Wilson F H (eds) Geologic Studies in Alaska by the U.S. Geological Survey, 1999, U S Geol Surv Prof Pap, 1633: 13-34. Ward P L, Matumoto T, 1967. A summary of volcanic and seismic activity in Katmai National Monument, Alaska. Bull Volcanol, 31: 107-130. There is no Deformation History data available for Snowy Mountain. There is no Emissions History data available for Snowy Mountain. Compound, 2161-m-high Snowy Mountain volcano lies 15 km NE of Mount Katmai. 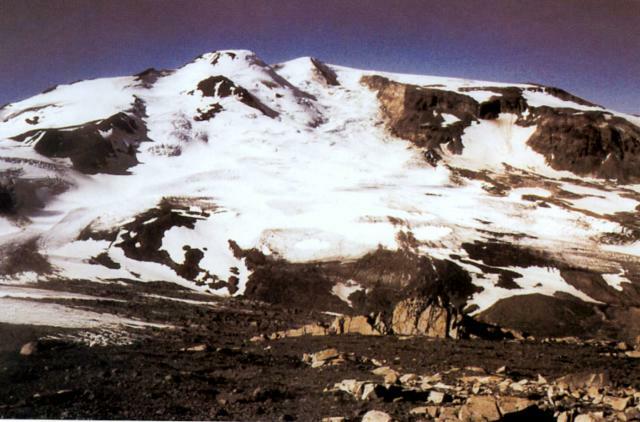 An ice-topped Holocene lava dome on the central skyline partly fills an ice-mantled amphitheater that formed as a result of edifice collapse of the NE slope of the NE Snowy edifice. The true summit (Peak 7090) lies just behind the dome to its right. The Serpent Tongue glacier spills from the amphitheater. No historical eruptive activity has been documented, but fumarolic activity has been observed at NE Snowy, along with a zone of shallow seismicity. Photo courtesy of U.S. Geological Survey, 1999 (published in Hildreth et al., 2001). There are no samples for Snowy Mountain in the Smithsonian's NMNH Department of Mineral Sciences Rock and Ore collection. IRIS seismic stations/networks Incorporated Research Institutions for Seismology (IRIS) Data Services map showing the location of seismic stations from all available networks (permanent or temporary) within a radius of 0.18° (about 20 km at mid-latitudes) from the given location of Snowy Mountain. Users can customize a variety of filters and options in the left panel. Note that if there are no stations are known the map will default to show the entire world with a "No data matched request" error notice. Large Eruptions of Snowy Mountain Information about large Quaternary eruptions (VEI >= 4) is cataloged in the Large Magnitude Explosive Volcanic Eruptions (LaMEVE) database of the Volcano Global Risk Identification and Analysis Project (VOGRIPA).